Now you must be thinking about a campsite....we'll be looking for you. Our campgrounds and campsites are definitely "horse friendly", but a horse is not a requirement to book a stay for camping at the River Valley Lodge and Campground. 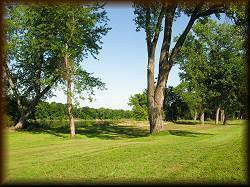 You will find fifty (50) campground sites that are equipped with both water and electricity and an abundance of primitive campsites. Of course, all of these campsites have access to the beautiful climate controlled shower house. One side of the shower house is for men and the other side for women and each side is decorated accordingly. 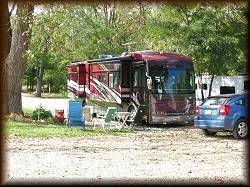 Also available to all campers is a coin operated laundry, a very unique playground for the children, a fishing pond, many trails for horseback riding, a large warm up arena, a covered stall is included if available. If you don't have a camper or tent there is even a bunkhouse that sleeps six (6) and a one (1) room log cabin that you can rent. Steve and Carolyn think that horses should also be comfortable so there is also a wash and rolling area for your horse(s). You can read the details of many of the above facilities on other pages on this site. Again, the campground is open to all, horses or not. The campsites that include water and electricity also have included a fire pit, picnic table, and one stall for your convenience. The daily rate for these fully equipped campsites is $34.00 for Friday and Saturday nights and $28.00 Sunday through Thursday. Additional stalls rent for $10.00 per day Friday and Saturday and $8.00 Sunday through Thursday. The primitive campsites are available for $15.00 per day no matter what day of the week it is. 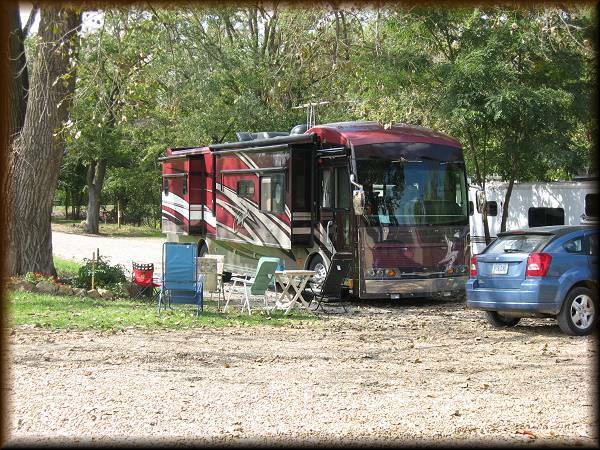 We prefer that horses stay on the main campground and not on the river side of the road. You may rent a stall for $10.00 per day Friday and Saturday and $8.00 Sunday through Thursday. 20' by 30' pens (four of them) are available for $10.00 per day any day of the week, or use the 150 feet of high ties at no additional cost. Reservations are recommended for either type of campsite. To give you a good idea of how many campers this campground will actually handle take a look at the image below (click to enlarge it). 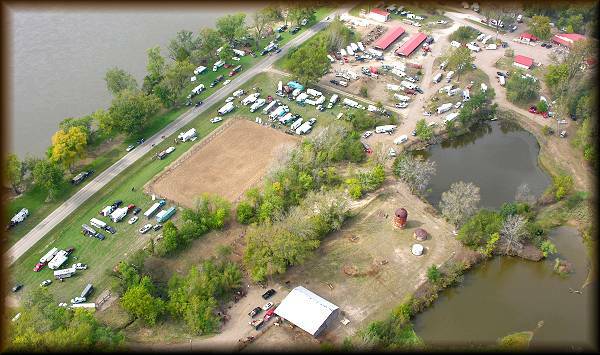 It is an aerial view of a 2007 trail ride which included approximately 400 individuals. Although the peace and quiet will make you think that you are definitely away from it all, you are only minutes away from groceries, gas, ice, and restaurants in the village of Farmington, Iowa......talk about the best of both worlds!